Everything all began with the first fallen child. When the first fallen child fell into the Underground, the Prince of Monsters found them and brought the child to the King and Queen. The King and Queen, seeing how lost and scared the child was, brought the child into the family, making them royalty. Hope bloomed in the Underground with the happiness of the Royal Family. However, one day, the child became very sick and died. Later that day, the Prince was missing. He was found coming back through the barrier, slowly turning to dust. In his arms, his dead sibling. He told his horrified parents that he brought his sibling to the Surface so that they may die surrounded by their favorite flowers, Buttercups. However, when the humans saw him, they attacked him. The Prince did not fight back and instead ran back home, where he would soon die on the Golden Flowers of the kingdom. In a village at the base of Mt. Ebott, lived a child. A child with rosy cheeks and ruby eyes, with auburn hair and fair skin. A child that wore a green sweater with a yellow stripe, and had a wide smile on their face. One day, this child vanished. The villagers searched and searched, yet they never found the child. Until a horrible beast with sharp fangs and pointed horns came to the village, in its arms was the child. The child seemed angelic in the creature's embrace, as if they were simply asleep. However, when the villagers took a closer look, they discovered that the child was dead. It was then that the village decided to vanquish the foul being, to keep the other children safe. And so the villagers fought the demon and drove it away from the village. The horrible beast was never seen again, along with the child that went missing. After the death of the Prince and the first fallen child, the King declared that any human who fell into the Underground should be killed and their souls brought to him. He wished to use those souls to break the barrier and declare war on the humans for what they had done to his son. The Queen, hearing this, disappeared. She did not want to be part of such horror. Many of the children who fell traveled through the Underground to the only other place that had a way back to the Surface. It was the gateway the Prince used to enter the Surface. And it was located in the King's home. Despite how foolish it seemed to travel directly to the person who ordered for their death, many of these children were desperate to go home. And, one by one, they were slayed by the King. Monsters age differently than humans. This is because they do not have physical matter. Monsters are made from magic, which is an intangible substance. Because of the magic they posses, they develop slower than humans. 50 years for a human would be 1 year for Monsters. Monsters only tend to age rapidly when they have children. A monster's child would steadily drain magic from their parents, making the monster parents age rapidly. The child drains the magic in order to gain more substance for their physical form. The child will only stop draining their parent's magic when they are at their prime. Once at their prime, monster parents will resume their normal aging rate. Long ago, in the beginning of the world, monsters were a very . . . uncivilized species. Monsters often killed for territory, spouses, and food. They even killed just for the sake of killing. Monsters were born with magic, so we often used it for killing as well. However, a problem soon occurred. Our species as a whole was slowly numbering us down to extinction. The strongest monsters of that time, seeing slow extinction in their future, came together and used their magic to create the boards. These boards were created so that whenever a magic user went into a fight, they would pop up to assist said magic user. These boards helped weaker monsters avoid stronger monsters, find other ways to resolve conflicts, communicate to other monsters, stop unnecessary killing, and even gave time for monsters to flee when in trouble. Because of these boards, many monsters stopped killing others, making the population increase as a consequence. LV is actually called LOVE. However, LOVE is an acronym for 'Level Of ViolencE'. It was what monsters used back then to distinguish who was dangerous and who was not. EXP is also an acronym. More specifically, it is an acronym for 'EXecution Points'. EXP made it so those monsters with high levels of LV should be killed due to how dangerous they were. Often many monsters formed mobs to execute those kinds of monsters. The War began because humans feared that monsters would steal their souls. This fear was so great that the humans waged a war against monsters. The War was hard and brutal. Many humans and monsters were dying. And many thought that the War would last for ages. However, it all ended when seven human mages came together to defeat the monsters. They used their power to create a barrier to seal the monsters under the mountain. Asgore, the person who took up Kingship in the Underground, found out with the help of his Royal Scientist that the only way to break out of the Barrier is with seven souls. Seven souls for the seven mages who cast the Barrier. The War began at the beginning of the Dark Ages. A period where there was a lack of literature and the Church dominated Europe. Back then the Church would preach that monsters were demons in disguised. When the monsters were sealed Underground, the Church destroyed any trace of monsters on the Surface. They even had the burning of the books, destroying any information about monsters. Making it so that humans won't remember the War nor monsters. Monsters are made of Love, Hope, and Compassion. They have LOVE, which is 'Level Of ViolencE'. It is also known as LV. Then they have 'HoPe', which is also known as 'Health Points'. It is shortened to HP. For monsters, 'HoPe' and 'Health Points' are the same thing, so if anything happens to their 'HoPe' then it will affect their 'Health Points'. This is why monsters need 'HoPe', without it, monsters will dust then and there on the spot. It stands for 'Magic Power'. It is also known more commonly to monsters as Soul Expression and it is shortened to MP. MP depends on your emotions and will power. If anything happens to either of them, then it will affect a monster's MP. Because of that potential weakness, MP is never shown to anyone else except their owners. It is a private thing, so [CHECK] won't work on it. It is also only shown to people who have magic. Monsters, when they die, they turn to dust. And when they turn to dust, their soul shatters into pieces. Because of this, there is no afterlife for monsters. Once a soul shatters, it is destroyed from existence entirely. So, in the ancient monster tradition, it is customary to spread their dust on their most precious belongings. It was believed that the dust of the monster would infuse into these belongings, letting their spirit continue living on in the world in a way. The inventory has the power to put any object that a person has in their grasp into a hammer space. A hammer space is an extra-dimensional, instantly accessible storage area. The hammer space belongs completely to the person with the inventory. Only the owner of the inventory can have access to it. Most private inventories can be accessed through a phone. Inventories that can be accessed by everyone, however, do exist. Most of these inventories are in the general public areas. They often come in the shape of a box. Most inventories have a space limit. The space limit for phone inventories is 8 slots. The space limit for box inventories is 10 slots. People can put any item or object in the slots, no matter the size or shape. 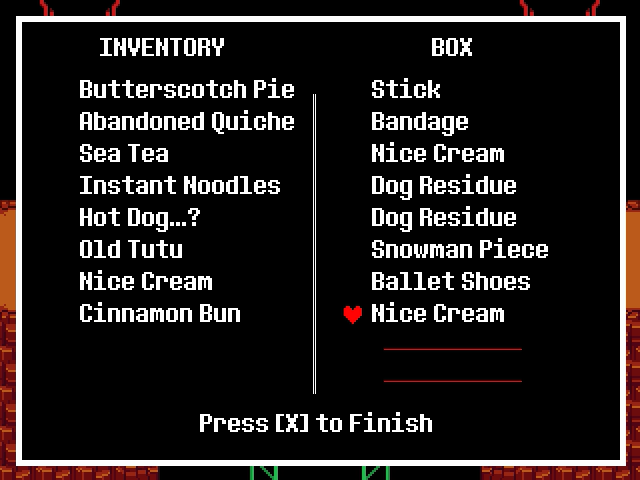 The inventory also has an opening form in the board. It is the [ITEM] button. The Royal Judge, Jury, and Executioner is a monster of renown power. They are one of the most powerful monsters in the Monster Kingdom, second to the King. The Royal Judge, Jury, and Executioner is often the last line of defense before any monster or human meets the King. Their identity is often hidden away from the general populace, only the King knows who they are. Most of the time, the Royal Judge, Jury, and Executioner poses as an unremarkable member of the Royal Guard. The Royal Judge, Jury, and Executioner does this to observe, without bias, any monsters or humans before they go to trial. The duty of the Royal Judge, Jury, and Executioner is to put monsters and humans that are a danger to the Monster Kingdom on trial. They also pass judgement on those very same monsters and humans. As well as executing any prisoners or outlaws on behalf of the Monster Kingdom. They can die from three things. Monsters can perish from severe wounds, the end of their natural life span, or a lack of HoPe (most commonly known as HP). Monsters that have severe wounds instantly turn into dust, their souls shattering soon afterwards. These severe wounds can come from other monsters, human-wielded objects, or from heavy magic. Monsters that are about to expire of age will lie down, immobile, and turn into dust. This is a non-violent death that most monsters wish for. Monsters that lack HoPe will become unresponsive to the world and enter a vegetative state, similar to a coma. We call this state 'Fallen Down'. A monster who has Fallen Down will soon perish, turning into dust. There are four signs to discern if someone has Fallen Down. A monster doesn't have any energy to do regular day activities for a long period of time. A monster has uncontrollable mood swings, switching from extreme agitation and explosive irritability to excessive guilt and unhealthy sadness. A monster isolates themselves from their friends, family, and community. A monster has a severe lack of self-esteem, self-care, and self-motivation. When two monsters begin a [FIGHT] with each other, it is called an Engagement. In an Engagement, boards will appear with four options to choose from: [FIGHT], [ACT], [ITEM], and [MERCY]. Each option has a specific function. [FIGHT] is activated when the monsters in Engagement wish to fight. [ACT] is activated when monsters wish to interact in an Engagement. [ITEM] is activated when monsters wish to use an item in an Engagement. [MERCY] is activated when monsters wish to peacefully resolve an Engagement. Engagement is mostly used as a way to resolve an issue. It is also used as a way to socialize since 'Soul Expression' is often involved in Engagements. More rarely, an Engagement can be used as a way to bring out 'Soul Expression'. Most Engagements are automatically created when one opponent is a magic user. This is because the boards that are used for Engagements can only be summoned by magic. *Soul Expression – The Expression of the Soul; Magic Power. The first time a monster is brought in an Engagement, the monster in question would feel unnaturally heavy and not be able to move. This feeling would occur because the body is still acclimating to the sensation of their soul being out of their body. It is only when the monster becomes involved in more Engagements that the monster will become used to the sensation. In Engagements, the monster's soul will be stuck in a range limit. This is due to the fact that if their souls leave the range limit, they will die. The range limit is a naturally occurring limitation and will always be used when the soul is out of the monster's body. In an Engagement, there is only one turn per monster. There are some monsters who can bypass such limits, however, it takes much will power to do so. Monsters cannot [CHECK] their opponent's MP or [FIGHT], [ACT], [ITEM], or [MERCY] options. All [MERCY] options are the same. Monsters cannot see other monster's boards. They can only see their ATK and DEF which adds up to their MP. It is possible to harm grievously and/or to kill in an Engagement. An Engagement is mostly used for one-on-one confrontations, however, it is possible for multiple people to be in an Engagement. When this occurs, most of the monsters 'team-up' to make the Engagement more organized and even. A monster's soul will always come out during an Engagement due to the nature of the boards. However, monsters will only be able to see their opponent's soul when they [FIGHT]. This is because souls are private matters. A monster's soul and body are connected. When the soul is attacked, the monster will feel pain in their body due to the connection between them. Physical injuries would also appear due to the fact that any pain that the soul feels will be amplified to the monster's physical body. This amplification would trick the monster's body to think that they were injured. The monster's body would then injure itself to match the amplification. When a monster's body is attacked, their soul won't feel pain. 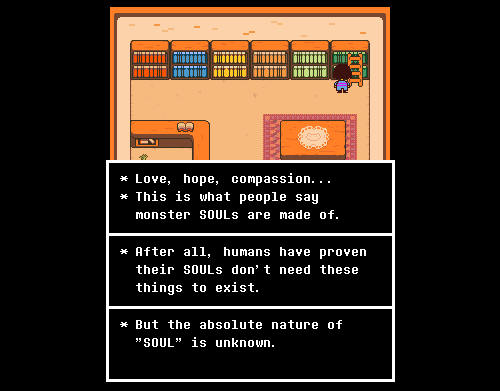 Soul colors often determine the soul traits and magic of a monster. 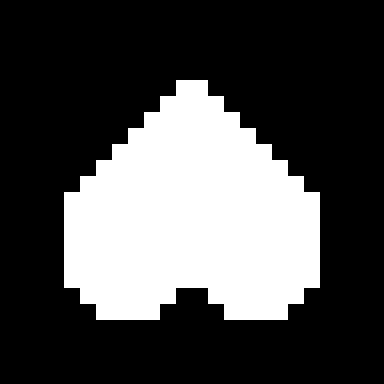 Monster souls are shaped like upside down hearts. Their souls are entirely colored white. You can only tell their soul traits from the color that glows around the soul. 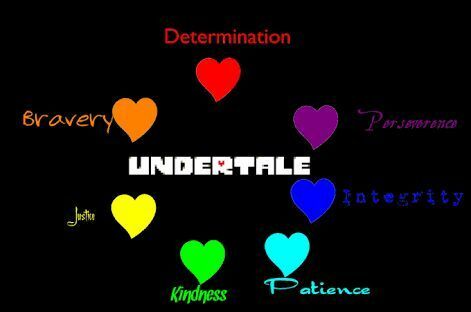 Souls colors can also determine the soul traits of a human. For humans, their souls are shaped like hearts. Their entire soul is colored the same color as their soul traits. Most souls have multiple colors in varying ratios. It is rare for a soul to only have one color, or for them to have all colors in equal ratios. 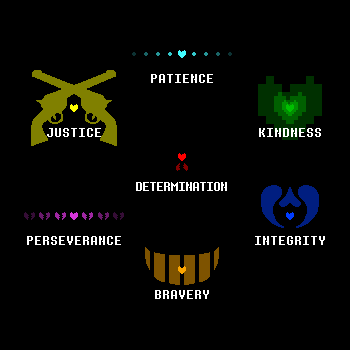 Each soul trait has a special magic ability. Only a few monsters can use the special magic ability of their trait. Because of this, many monsters do not know what the special magic ability of each trait is. Most monsters use their family magic primarily with their personal magic coming in second. Personal magic mostly depends on the monster in question and how they express their magic. Most monsters will not have the soul trait of 'Determination' since such a trait will cause monsters to melt from the intense power. Only Goat Boss Monsters can have this trait. Even so, it still causes problems for the monster's body. *Family Magic - Magic that has been passed down generations in family lines and are uniquely attributed to the family's character traits. *Personal Magic - Magic that is expressed based on the individual monster rather than their family characteristics. *Special Ability Magic - This Special Ability Magic is the magic trump card for each specific soul trait. Monster souls, when they die, will shatter once their body turn to dust. Human souls, however, have the power to still linger on. Human souls that linger on will become 'spirits'. Those human souls, if they lingered on for a long period of time, would convert from spirits into ghosts. Ghosts are more powerful than spirits, with the ability to interact with the physical world, something that spirits are unable to do. Ghost monsters are created from human souls. Human souls, that linger after death for a long time, transform into Ghost monsters when surrounded by an abundance of magic. Their souls become inverted from the magic, thus changing them into monsters. Skeleton monsters are created from human bodies and human souls. Skeleton monsters are formed similarly to Ghost monsters, the only exception is that the human bodies transform with their soul. The abundance of magic that surrounds the dead human envelopes their soul and body, transforming them into Skeleton monsters. Their souls become inverted from the magic and begin occupying a nearby vessel, the human's former exoskeleton, thus changing them into monsters. When a monster absorbs a human soul, they will gain tremendous power. In fact, with one human soul, most monsters would be strong enough to match a Boss Monster. If a monster absorbed three human souls, they would be strong enough to match a Human Mage. It was theorized that a monster with seven human souls will have the power that rivals a God. Humans cannot absorb monster souls. This is due to the fact that monster souls shatter after they die. However, it is possible that a human can absorb a Boss Monster's soul since they linger a few minutes before they shatter. There has never been any records, however, of a human absorbing a Boss Monster's soul. It is theorized, though, that if a human absorbed a Boss Monster's soul, they would be able to match the strength of seven Boss Monsters. Monsters cannot absorb another monster's soul. This is because monster souls disappear quickly. They can only absorb their dust, this causes their LV or LOVE to rise. It was theorized, however, that if a monster did absorb another monster's soul, they would enter a Fusion. Fusion is where the souls of both monsters would be fused, creating an entirely new being. Humans cannot absorb another human's soul. If a human has another human's soul inside them, then it is called Possession. The two souls in the body would fight to gain control. This is due to the power of a human soul, the body can only handle one of them in control. Dangerous side effects can occur with both human souls trying to take control of the body. However, if the two human souls work together to take control of the body, Harmonization would occur. Harmonization is when the two souls overlap with each other to closely resemble one synchronized unit.